Justin Chatwin as Goku in Dragonball: Evolution, the long-awaited, live-action motion picture based on the popular Japanese manga created by Akira Toriyama. CHICAGO – This 16-image slideshow contains the press images for Twentieth Century Fox’s “Dragonball Evolution,” starring Justin Chatwin, Emmy Rossum, Jamie Chung, James Marsters, and Chow Yun-Fat. Written by Ben Ramsey and directed by James Wong, the film opens on Wednesday, April 8th, 2009. Synopsis: “Dragonball: Evolution” is the long-awaited, live-action motion picture based on the popular Japanese manga created by Akira Toriyama. Toriyama’s work spawned best selling graphic novels, videogames and a phenomenally successful television series. The manga, series and games bring to the new film a rich mythology and exciting, complex characters - all of which have captivated millions of fans, of all ages, around the globe. One of the greatest manga franchises ever created, Dragonball has an enormous online fan base and is consistently one of the most frequently searched-for terms on Google and Yahoo! You can click “Next” and “Previous” to scan through this slideshow or jump directly to individual photos with the captioned links below. All photos credited to Nels Israelson and Twentieth Century Fox. All Rights Reserved. dragonball_01: Justin Chatwin as Goku in “Dragonball: Evolution,” the long-awaited, live-action motion picture based on the popular Japanese manga created by Akira Toriyama. dragonball_02: Justin Chatwin is the heroic Goku, a powerful warrior who protects the Earth from an endless stream of rogues bent on dominating the Universe and controlling the mystical objects known as Dragonballs. 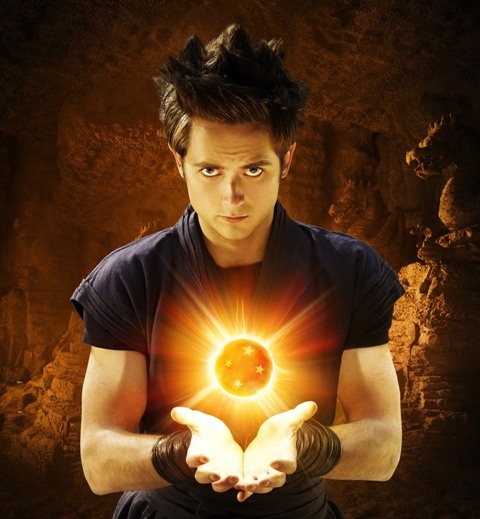 dragonball_03: Goku (Justin Chatwin) holds a Dragonball, a mystical object that together with six others like it could control the fate of the universe. dragonball_04: Justin Chatwin is the heroic Goku, a powerful warrior who protects the Earth from an endless stream of rogues bent on dominating the Universe and controlling the mystical objects known as Dragonballs. dragonball_05: Bulma (Emmy Rossum) is a scientist who joins Goku on his journey to retrieve the mystical Dragonballs. dragonball_06: Screen legend Chow Yun-Fat is Master Roshi, who guides Goku on the young man’s epic quest to save the Earth from the forces of darkness. dragonball_07: James Marsters is Lord Piccolo, whose return to Earth could signal the planet’s destruction. dragonball_08: Jamie Chung is Chi Chi, a young martial artist who captures Goku’s eye. dragonball_09: Justin Chatwin as Goku and Emmy Rossum as Bulma in “Dragonball: Evolution,” the long-awaited, live-action motion picture based on the popular Japanese manga created by Akira Toriyama. dragonball_10: Bulma (Emmy Rossum) and Goku (Justin Chatwin) plot their next moves to retrieve the remaining Dragonballs, the mystical objects that together could control the fate of the universe. dragonball_11: Bulma (Emmy Rossum) and Goku (Justin Chatwin) plot their next moves to retrieve the remaining Dragonballs, the mystical objects that together could control the fate of the universe. dragonball_12: Bulma (Emmy Rossum) and Goku (Justin Chatwin) scour the world in a tricked-out truck, in search of the mystical Dragonballs. dragonball_13: Master Roshi (Chow Yun-Fat) takes Goku (Justin Chatwin) under his wing, as they begin the search for the Dragonballs. dragonball_14: Lord Piccolo (James Marsters), a being of immense power, and Mai (Eriko), his ruthless assassin, prepare to harness the world-changing energies of the Dragonballs. dragonball_15: Lord Piccolo (James Marsters), a being of immense power, and Mai (Eriko), his ruthless assassin, take the next step to acquire the Dragonballs. Submitted by clfranklin237 on March 26, 2009 - 6:17pm. I know it’s sad, but I think this could be a fun movie. Submitted by HollywoodChicago.com on March 26, 2009 - 6:31pm.